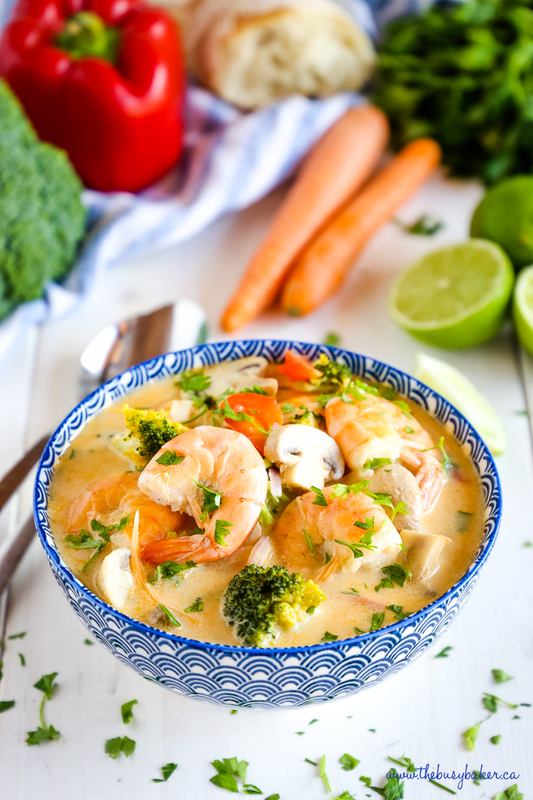 This Thai Coconut Curry Shrimp Soup is packed with vegetables and bursting with Thai flavours! 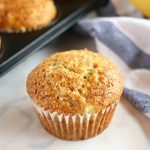 It’s dairy-free and comes together in 30 minutes or less! Happy Friday friends! 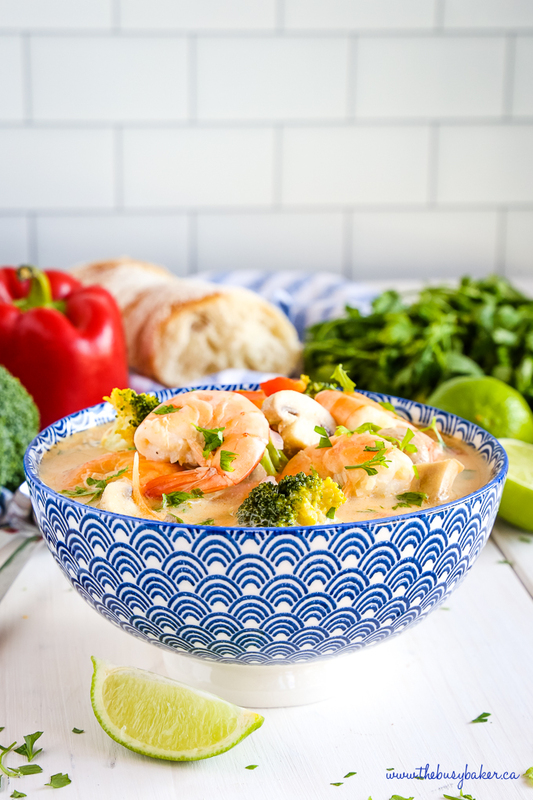 I’m so excited to be sharing this delicious Thai Coconut Curry Shrimp Soup with you today! 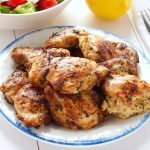 It’s one of our family’s favourite cold weather recipes, but it’s so delicious we enjoy it all year round! If you’re dairy-free or enjoy all those delicious Thai flavours, you will LOVE this recipe! 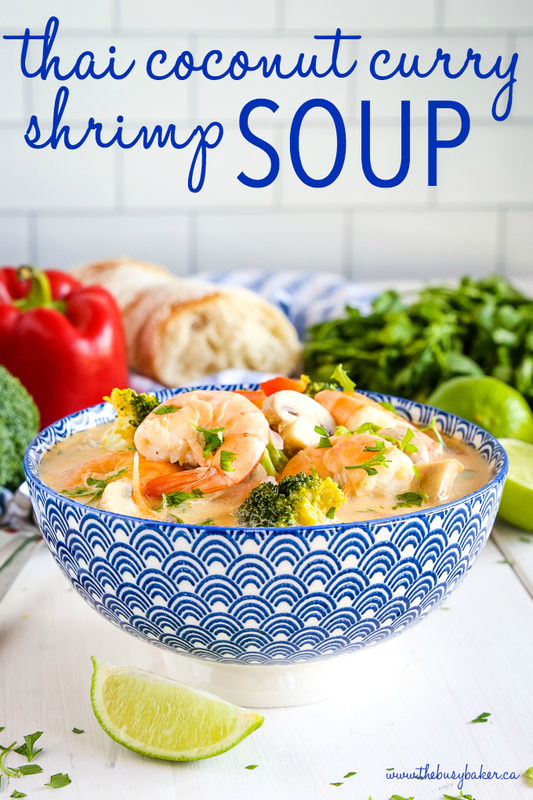 There’s nothing quite like a simple soup that comes together in no time flat, and this Thai Coconut Curry Shrimp Soup can be on the table in under 30 minutes, making it a great meal idea on a busy weeknight or anytime you get the craving for Thai food! 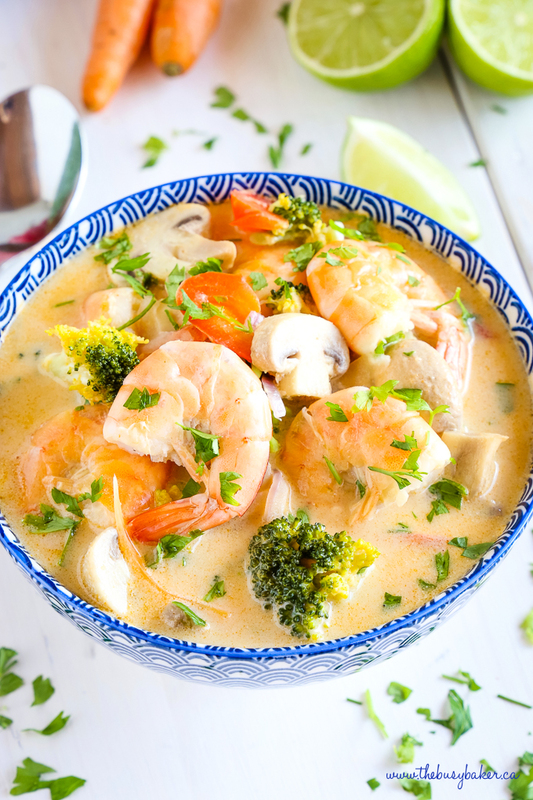 Skip the takeout, and make this Thai Coconut Curry Shrimp Soup instead! 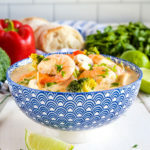 Like this Thai Coconut Curry Shrimp Soup recipe? You’ll LOVE this Best Ever One Pot Beef Stew or this Crock Pot French Onion Soup with White Beans! 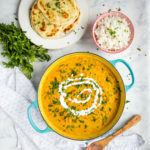 If you’re looking for a good Dutch Oven pot for recipes like this Thai Coconut Curry Shrimp Soup, here’s my best advice- the Dutch Oven pot I use is a total beauty from Le Creuset (affiliate link) and it gets used in my kitchen almost ever day throughout the year for all kinds of soups, stews, sauces, curries, and even for baking crusty artisan bread bread (if you want my original Dutch Oven Crusty Bread recipe, grab it HERE! It goes GREAT with this Thai Coconut Curry Shrimp Soup!). A pot like mine is definitely a financial investment, but considering how much I use it and considering its high quality, it’s definitely a worthy investment since it will last for 10 or 20 years, or even longer! I’ve also used similar cast iron pots from other brands, like THIS ONE from KitchenAid and THIS ONE from Lodge Cast Iron (both affiliate links) if you’re looking for something a little less expensive but still high quality that’ll do the job well. 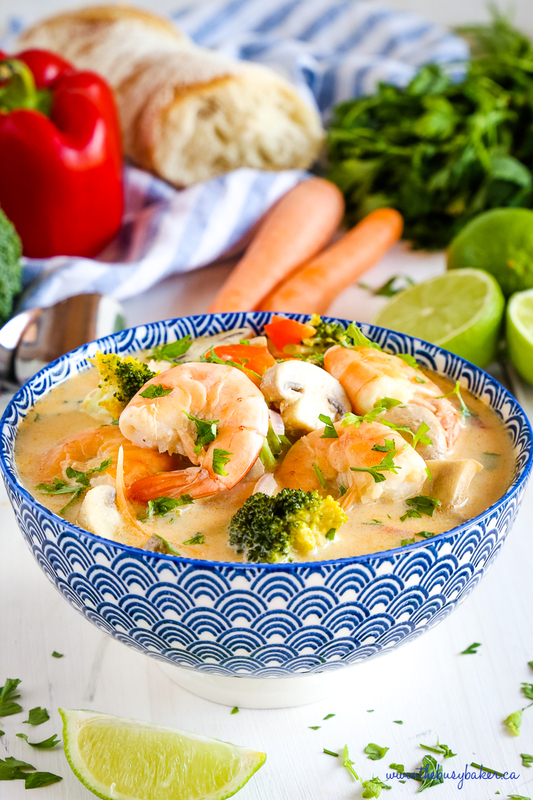 I hope you love this Thai Coconut Curry Shrimp Soup as much as we do! Let me know in the comments below, what’s your favourite way to enjoy Thai food? I’d love to know! 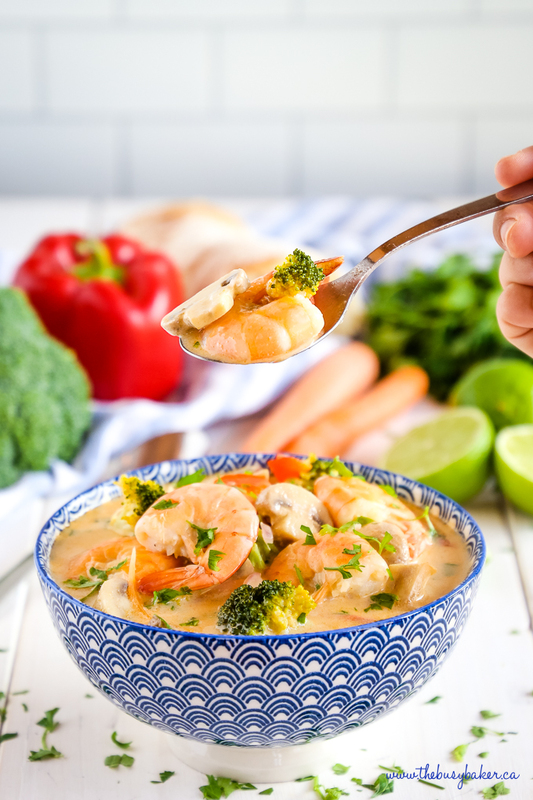 This Thai Coconut Curry Shrimp Soup is packed with vegetables and bursting with Thai flavours! It's dairy-free and comes together in 30 minutes or less! Heat a large pot over medium high heat. Add the olive oil. Once the oil has heated add the curry paste, honey, fish sauce, ginger, lime juice and zest, and salt and pepper. These are the aromatics of the recipe (the flavour-builders), so let them heat up nicely for several minutes, stirring regularly. Add the coconut milk and stock, stir well and cover the pot, letting the soup simmer for about 10 minutes, stirring regularly. Add the uncooked shrimp, bell pepper, onions, mushrooms, carrots, and broccoli and stir well to combine. Cover the pot again and let cook for about 7-10 minutes, turning the heat to medium low. After this time, the shrimp should be cooked through and the veggies should have softened slightly (you don't want them to be falling apart and mushy - they should still hold their shape in a soup like this). Serve in large bowls with crusty bread for dipping, with a sprinkling of fresh cilantro and some fresh lime wedges, if desired. This soup can be stored in the fridge as leftovers for up to 2 days. Feel free to substitute light coconut milk (canned) for the full fat version. 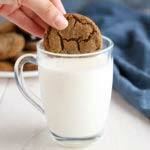 Using coconut milk beverages are not recommended as they contain too much water. 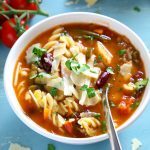 This soup will be on my mind all weekend until I make it!! Love this! 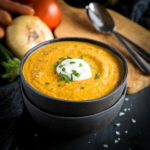 Love a quick soup recipe! Can’t wait to try! All these goodness in one soup! I want it so much! Yummy! 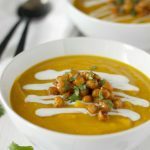 What a great soup to warm up with on a cold day! I absolutely love the flavors here! I never thought that shrimp can be so delicious in a soup. My Hubby already asked if I can make it again soon. Five stars! So glad you enjoyed it so much!! Now THIS is a hearty bowl of soup! Love that it’s dairy free! OMG! Yes, please! This soup looks amazing! I would like a big bowl right now! The flavors you have combined into this soup really takes it to the next level. I can’t wait to make this again. The soup looks so good I can’t wait to try it! It looks so comforting for winter!